When you are getting ready to plan a trip, you must select a convenient time that will give you flexibility of one to two days. This will make the trip more about you, and less about your timetable. You may run into weather problems or you may just want to camp for an extra day. Next, choose a location and make it specific. Don’t just choose a county where you saw a campground. Call the campground or the park office and get reservations or information about the time you have allotted. Many parks are happy give you information and tips about what to expect. The most complicated step in preparation is making a list of what to bring. Making a list is essential and your list will change dramatically the more you trips you take. Remember, tents are a luxury and heavy to carry. Hikers usually bring a plastic tarp that can shelter up to four people. With a tarp, you can tie it between trees for cover from the elements. Many time you won’t even need that but you can always lay the tarp on the ground to designate a clean sleeping area. After this has been set, you will go over what food you will need. We stress need here. Stray from fresh produce and meets because they spoil easy and their scent attracts animals and insects. Stick to dried food and canned items. Canned items will add weight, but they are more calorie rich and very easy to cook in multiple situations. Most of your food should be snacks, so that you don’t have to cook very much. Trail mix and yogurt covered raisins will fill you up more than you think, and they are a cheap alternative to buying food from camping stores that hike up the price on dried meals. 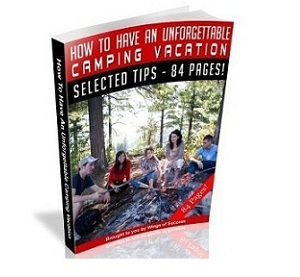 There are millions of people everywhere who enjoy the relaxation of camping. Whether you’re spending the weekend camping with your family at the local state park or backpacking through the backcountry, there are some general rules of camping safety that you should always follow. Many of these camping safety tips are simply common sense, but it is still a good idea to review these guidelines before setting out for any type of outdoor adventure. Camping safety begins before you ever set out on your vacation. Check the weather forecast ahead of time and be prepared for rain or storms. Pack emergency rain gear, as well as a well-stocked first aid kit, and plan to arrive at your campsite as early as possible. You want plenty of time to set up camp before the sun sets. Upon arrival, inspect your campsite closely for glass and harmful debris, poisonous plants and animals, and areas that may be prone to flooding in the case of a heavy downpour. Set up your tent on flat ground and remove any rocks, branches, or other objects that could damage your tent or be uncomfortable to sleep on. If you are camping with children, check the campsite closely for fire ants, hornet or wasp nests, dangerous grades, and other potential hazards before settling in. Wear light colors and refrain from using scented lotions, soaps, and perfumes to prevent attracting bees and mosquitoes. Coleman citronella candles can ward off mosquitoes as well. Use caution whenever you operate your propane stove or grill and anytime you have a campfire. Never leave any of these unattended. Keep your campsite clean, storing food in closed containers and disposing of garbage, to reduce the chances of bears, raccoons, or other wild animals entering your campsite. Never keep food items inside your tent. Anytime you decide to enjoy the great outdoors, it is important to remember that you are in nature’s domain. To stay safe, it is your responsibility to follow the proper safety precautions. It is a good idea to become familiar with poisonous and harmful plants, animals, and insects that are common to your area. Always carry a small first aid kit while hiking or biking and have knowledge of first aid procedures for outdoors. If you should come in contact with poison ivy or sumac, apply calamine lotion to the infected area to relieve the itching. Stay on the designated trail and avoid high grass and overgrowth. Wear light colors so ticks are easy to spot and check your head and body for any possible ticks each night. If you find a tick that has already bitten, remove it gently with tweezers, taking care not to crush the body or leave the head. Clean the bite area with warm water and soap and see a doctor if you experience a fever or rash within the next few days or if you think the tick was attached for more than 2 days. Never enjoy the beauty of nature alone. Have at least one companion with you wherever you go and whatever you are doing outdoors and tell your friends and family where you will be and how long you plan to be gone. Tent. You can find a wide selection of tents in various sizes from 2 person tents to family sizes. You might consider getting the children their own tent. They will enjoy having their own space. Sleeping bags and an air mattress if desired. Flash lights and extra batteries. Cookware. Cooking on an open fire will probably not be good for your best cookware so you might want to bring older pots and pans or consider buying a camping cookware set. Think ahead about foods that will be easy to cook on a fire. Firewood. If you are not camping at an established campground you may not have access to firewood. First Aid kit. This should include band aids, peroxide, gauze, burn crème, tape, a tool for removing splinters, and anti bug spray. Trash bags. Whether you go camping at an established campground or in the woods somewhere it is imperative that you leave the area exactly as you found it. If the location does not have trash bins then pick up your trash and take it with you. Don’t ruin the experience for the next family. With the rising costs of everything in today’s society, it is difficult to afford a fun vacation for the whole family. Many people try to save throughout the year for that one special week on a beach or in a resort. Others give up on the idea altogether. With careful planning and forethought, almost any family can have a pleasant, memorable trip. Parents and kids alike will enjoy taking part in a budget family camping holiday. It doesn’t have to break the bank or cause a lot of stress. A few simple tips can make the fantasy a reality. The first aspect of a budget family camping holiday is getting all of the necessary equipment and accessories together. If you don’t already have camping equipment, this is the time to start watching sale ads and visiting local sporting goods stores. They often have great deals on camping items during the off season. So plan early and maybe surprise your family with camping equipment during the holidays. If camping is new to your family, consider the idea of borrowing tents and things from someone you know who does camp. That way you can save on expenses while deciding if camping is for you. Another way to reduce the cost of a family camping vacation is to pack as much food from home as possible. Take along anything non-perishable that can be fit into your vehicle. This will save money at the grocery stores or open-air markets during the budget family camping holiday. Another advantage is that you already know everyone in the family likes the food choices. If you are camping with a very young child be sure to take along plenty of diapers, baby food, and other baby essentials to avoid paying high prices at convenience stores. You could shop around the campgrounds in the area you are planning to visit. However most public campgrounds are usually similar in price for a night. Most range from $8 to $16 a night and include restroom facilities and other amenities unless you are truly roughing it. While staying in the grounds take advantage of any special activities the campground has scheduled. They often have nature hikes, craft time, and even evening events planned for their visitors. Most of the time they are included with the camping fee and help to keep things exciting in the great outdoors. The price of a night in the campgrounds and all of the extras is small compared to other vacation options and very useful in planning a budget family camping holiday. If planned right and with proper thought a budget family camping holiday will feel like a resort vacation. It doesn’t take a lot of money to have a good time. Traveling to the great outdoors and communing with nature is a enjoyable way to get out of the city and breathe in the fresh air. While you want a taste of living in nature, a camping trip doesn’t have to mean eating cold food and freezing at night. Some campsites don’t allow fires so contact the facility ahead of time or check out their website for information. In any case, cooking stoves and heaters designed for the outdoors provide a way of making your camping experience more enjoyable and comfortable. If you’re planning on driving to your campsite and have a large family then consider a stove with multiple burners. They allow you to cook bigger and multiple dishes. There are even stoves that have a grill for making eggs and pancakes. Special cookware for camping is made so you can make more than one dish at a time. They’re stackable so you can cook multiple dishes by using the heat from the bottom pot to heat the top one. You can prepare food more quickly and conserve your fuel. Remember to use the smallest pot or pan possible and as little water for boiling food; it will conserve your fuel. Camping stoves take various kinds of fuels and it usually depends on the manufacturer. Propane, butane or white gas (commonly referred to as “Coleman” fuel) is commonly used and preferable. Kerosene and unleaded gas is still used but is not preferred since it emits an unpleasant odor and are not as safe. Coleman fuel should be your first choice since it is the safest and burns clean without odor or charring. Propane is pricey and doesn’t burn as hot but it is the cleanest burning fuel. Fuel canisters come in various sizes and choosing the right size for your needs depends on how much cooking you’ll be doing and for how long you’ll be camping. If you’re hiking with your equipment then stick to a small canister and cook sparingly. Some campsites provide cooking facilities but it will be more convenient and less burdensome to bring your own cooking source. Planning ahead and bringing a cooking stove will ensure an enjoyable camping trip. If you can build a good fire for your camping trip then besides impressing your friends you can also truly enjoy the camping. Though many camping equipment these days make the conventional campfire that looks boring and miserable. If one knows how to build an appropriate campfire then it can really make a great difference. Previously, when there were no gas torches or matches at that time making an appropriate campfire was vital to any outdoor actions. People would enjoy here the warmth against cold weather and would cook foods for all. When the temperatures at night become lower then the campfires provide a space where everyone can assemble and enjoy the warmth. Besides heat, the campfire also drives back the wild animals and makes the place safe. Lions, other beasts, and wild dogs are not very eager to come near the campfire place. This is the reason that the campfires always remain burning all night. Although the skill of building campfires is lost partially as the matches seems to be more expedient. And campfire building as an art is still significant as well as vital to any camper’s trick lists. Firstly, the secret of beginning the campfires is that you have to start it fast. It is possible only if you know exactly what is required to begin the campfire i.e. fuel, oxygen and heat. The oxygen present around us is not readily obtainable all the time during campfire. The fuel should be arranged in a way that it can supply ample amount of air. This supply can also be increased by blowing in the cinder or by fanning the existing flames. Usually heat is produced through friction for the campfires. Perhaps, you have to utilize a group of techniques for producing this heat. The techniques include using flint stones, rubbing two sticks together etc. On the other hand, if you do not have the correct fuel then you will not get magnificent flames. The best tinder is like dry leaves, twigs, dry sticks and bark. These sticks are used to begin the fire and then help to continue it. Keep in mind that if the larger and harder pieces of wood are burnt then only you will succeed in building a fire. Tepee – For rapid fires and long lasting at night tepees are good. Lot of tinder is used so you will need enough amount of tinder. You have to place and balance the large burning wood next to each other around the tinder vertically. It assures that the gas and the heat of the tinder are produced in such a way so that it helps to burn the long pieces of wood. This fire is perfect for not only boiling water but for all other campfire purposes. Pyramid – Place the logs horizontally on the ground and make a pyramid then make one more layer on its top of the next, in this way slowly form the pyramid. Though it is very difficult to begin this kind of campfire but finally it will help you to produce a good amount of charcoal. You can use that later, it also burns very well and the fire also remains stable. Parallel – Parallel fire sets the tinder amid the two logs. It is an effectual burning fire as the logs are also burnt from inside. Thus the heat and the fire go within the two logs in a good and snug place. Star (Indian) – In old Western movies this kind of fire is normally seen. Logs lay out just like the spokes of the wheel. In the middle the tinder is placed. The fire can be easily maintained, however you only have to drive every spoke of the wheel on the middle when the burning of fuel takes place. Several other types of campfires are also available and they have their own definite reasons. However, with any type of outdoor art, building and sustaining needs a huge amount of practice to make it perfect. We often see that a mother tell their children not to play with fire. You should treat it with esteem because it is so powerful that it can save as well as demolish. Keep in mind to follow the safety measures after completing the use of fire. Cover the fire with water and if there are any leftovers of the campfire then cover it also with dirt and dust. If you do not pay attention to the fire then it can cause grave damage to the property. Thus always take measures so that everything should not get burnt. A person who is not experienced with camping or hiking may think that all backpacks are the same, but that is far from the truth. For a camper who is serious about making the most out of a camping trip, a backpack can make or break an excursion to the woods. Take the plight of a trekker who traveled to the Appalachians in 1994. Rather than a thrilling camping expedition, he needed to return home injured from the weight of an ill-fitted backpack that damaged his hips. A decade later, the same hiker, utilizing a backpack more suited to his needs, walked over 950 miles of terrain, turning what could have been another ugly experience into a more pleasant memory. There are a few key tips you should bear in mind when selecting a backpack for the outdoors. First, you need to assemble a fairly comprehensive list of gear you need to bring on the trip. Whereas some campers prefer to haul a bare minimum, others like to be well equipped and ready for almost any eventuality. Consequently, the size of your backpack is important. If you intend to camp or hike for several days – or even simply overnight -you need a sufficient amount of supplies to cover your time and prospective needs. Second, make sure your backpack is comfortable to wear for a lengthy period of time. The best styles of backpacks distribute the weight in the bag evenly so that you can wear it comfortably for a few hours while hiking. Try it on at the store to ensure it meets your need. Some camping stores even provide weights inside so you get the full effect of the backpack. By placing these in the pack, you can walk around the store to get a sense of how well the weight distributes and how much you can actually hold while remaining comfortable and not overly straining your back or shoulders. Third, select a frame for the backpack. You can choose between an internal and external frame, each of which has advantages and disadvantages. Internal frames are more slender and allow the pack to remain close to your body which makes it great for densely wooded and more narrow trails. They do not restrain your ability to move in the least, but are admittedly more cumbersome to load and sometimes do not hold as much gear. External frames, on the other hand, are great for clear walking paths and wider trails and are generally easier to pack. However, they tend to restrict mobility because they are larger and less flexible, making them seem more uncomfortable at first. External frames are the best option, though, when buying a backpack for beginners or children. Finally, when purchasing a backpack, take into consideration whether it is designed to work efficiently with weather sheets that help protect your pack against dew and rain. Also assess how attachments can be accommodated for your pack. Most backpacks have either rings or snap-ons (or both), allowing the convenient integration of accessories with your pack. Finding a backpack doesn’t need to be a challenge if you familiarize yourself with options ahead of time. By following these few tips, you should be able to purchase one that fits your budget and your camping experience needs, helping to make sure you have a wonderful adventure in the woods. Planning on going camping? Great! One of the first things you need to do is choose a spot. Here are several factors you should consider when choosing a camping spot, as well as a few tips for finding a good one. How are you going to get to your camping spot? Is it a “drive up camping spot” or is access via a foot trail. If access is via a foot trail, I would suggest finding a spot with a half mile or less hike for your first trip. What’s at the camping spot? Does it have good views? No sense going and camping in a boring place when there are many beautiful camping spots available. Does your camping spot have access to clean water? If not, you’ll have to pack in all of the water you need, including plenty to put out the fire with. Is there access to firewood at the camping spot. If you want a campfire, you don’t want to have to carry in the wood you’ll need! Be sure that you are allowed to harvest firewood for the area you are going. In most areas, you are allowed to pick up dead wood, but not cut down live trees. Live trees do not burn well, anyway. If you’re going into “uncharted areas” or plan on camping where there is no established camping spot, be sure that the terrain is such that you can pitch your tent without rolling down a hillside or sleeping on the rocks all night. Search online for “camping your state here” etc.